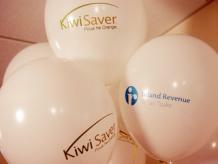 Workplace saving schemes have increased significantly since the introduction of KiwiSaver, Mercer Wealth Solutions said. Mercer said research on attitudes to savings showed a growth in KiwiSaver membership had coincided with increased consideration being given to saving for retirement. About 39 percent of people had given at least some thought to retirement, up from 33 percent in October. "This consideration may be a function of concern, with a corresponding rise in the proportion believing they will be less comfortable in retirement than now," Mercer said. Nearly one in three people claim to have at least a reasonable level of knowledge about KiwiSaver. However, there continues to be room for improvement, with one in four having only limited understanding of the scheme. Mercer's KiwiSaver Index found scheme participation rates jumped 11 percent in just three months, suggesting many were motivated to take the next step and join. In the process, New Zealanders may have experienced a bit of a reality check, and realised they may need more money in retirement than first thought. "It's very promising to see early signs that Kiwis are taking control of their financial future," he said. About 13 percent of New Zealanders had embraced KiwiSaver, 34 percent were reserving judgment and 33 percent were sceptical.